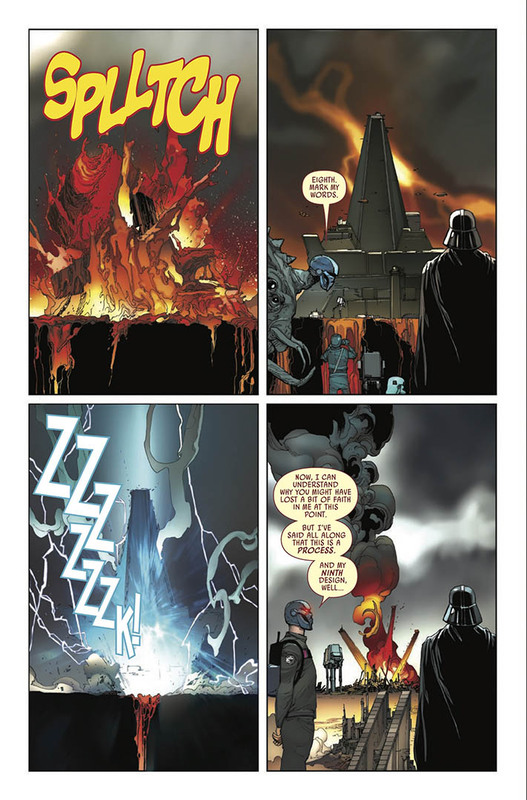 Spoiler warning: This story contains details and plot points from Darth Vader: Dark Lord of the Sith Issue #25. Since 2005, when Charles Soule first sat in a darkened movie theater and watched the newly born Darth Vader lurch off the surgical slab with an agonized cry of mourning, he’s been waiting to discover what happened after the credits rolled on Revenge of the Sith. 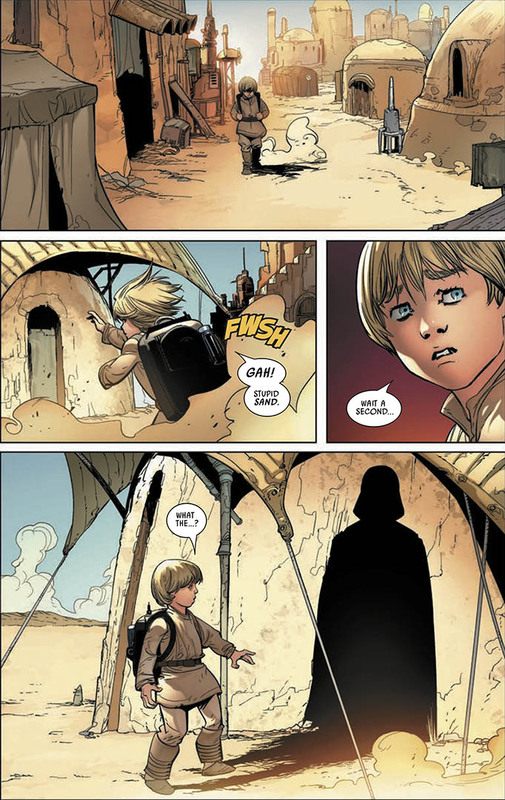 More than a decade later, his comic book series Marvel’s Darth Vader: Dark Lord of the Sith picked up at this pinnacle moment and invited fans on a visceral exploration of Anakin Skywalker’s transition beneath the mask. We’ve watched as he grew accustomed to his mechanized suit, sometimes being forced to rebuild himself from droid parts in the heat of battle. The story brought us closer to understanding Vader’s motivations and the Emperor’s power over his apprentice. His turn to the dark side has been punctuated by moments of light, an ambiguous action that can at once be read as Vader protecting his own interests or protecting the future, and levity. 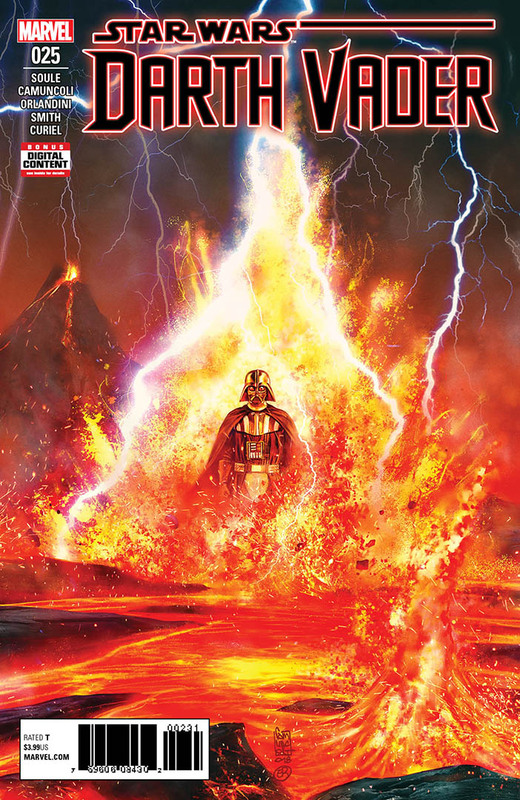 With a storyline that feels like an in inverse of the Mortis arc from The Clone Wars, where Anakin Skywalker was faced with a vision of his dark future, the final issue in the series invites us into Vader’s meditative mindscape on Mustafar as he travels among the ghosts of his past, a deeply moving journey woven with familiar images and dialogue clipped right from the Star Wars films and other stories. 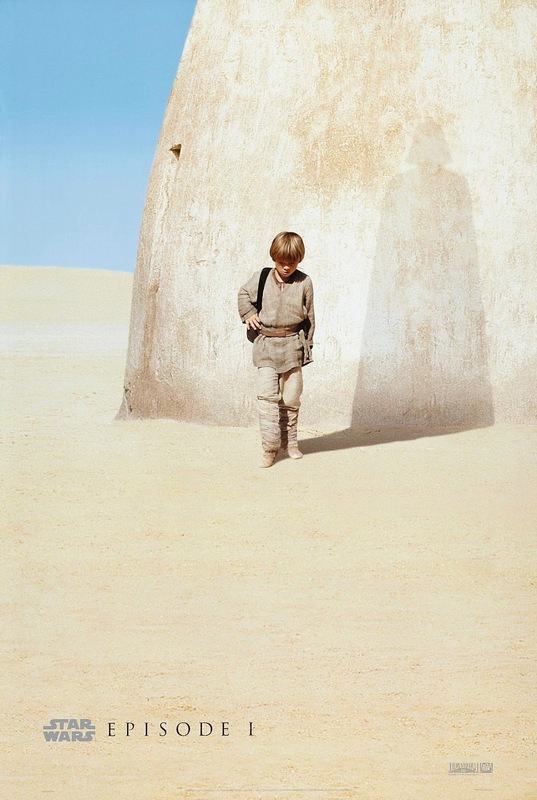 Vader confronts the looming shadow of his present form as it casts a pall over his childhood. Ultimately, he finds a twisted and evil version of Padmé and makes one last attempt to save her before accepting his fate, a pale vision of a single Jedi warrior seen just on the horizon. “He goes from no to yes in the series,” Soule says, literally bookending the first panel of the first issue and the last panel of the final issue with these simple words that denote a complete shift in the character’s thinking. “What he realizes in 25, and it was a very pointed choice to not show possibilities, everything he’s seen is stuff that’s already happened… What’s the point of doing anything other than this? This is all there is for me. But none of his previous projects were quite like facing Darth Vader. From the start, Soule and his creative team plotted out the 25-issue run, with the same core group working on each successive arc. “It’s a team that has been consistent, which is extremely unusual for a more-than-monthly comic book,” Soule says. For Soule, the series needed to be more about the metaphysical than the physical. Lightsaber-slashing stunts and fight choreography play a part, but the series is deeply character focused. “Everything we tried to do here was very much character-based, not just with Darth Vader, but also in the larger story of the galaxy, characters we know, the Empire growing, all of the things that would be happening as we transition from the prequel era into the original trilogy era,” Soule says. The series introduces the Inquisitors, connecting to Star Wars Rebels, as well as forging connections to The Clone Wars, and even the sequel trilogy. 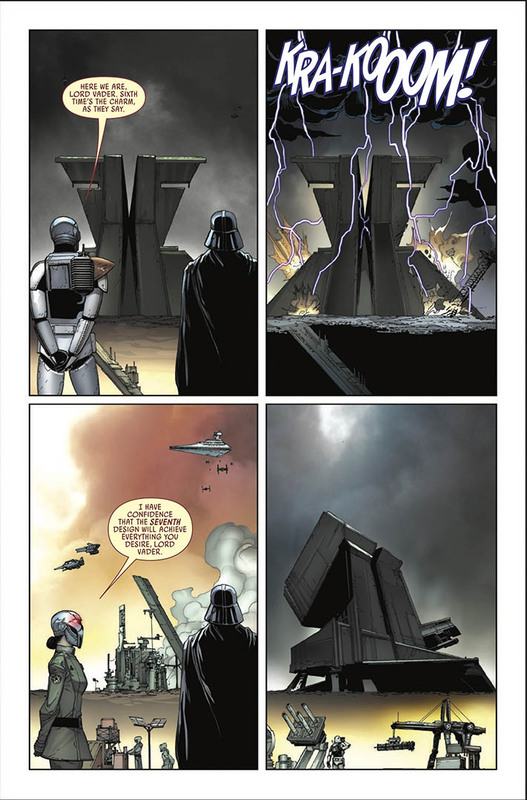 “There are so many ways that Vader as a comic serves as this central lynchpin between so many different parts of the current Star Wars universe and I think that is part of why people have responded to it the way they have,” Soule says. 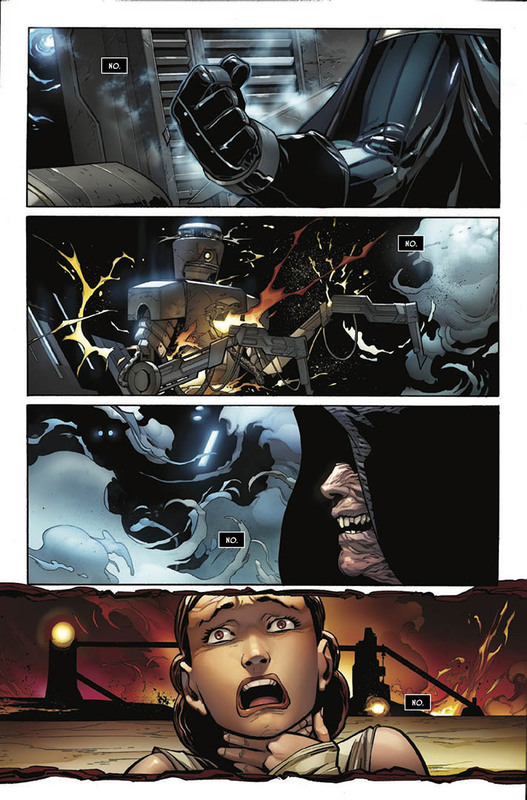 To walk beside Darth Vader on his final steps toward embracing the dark side, Soule and readers of the series would be confronting some of the character’s darkest moments. “It’s taking on a book about a person who was conceived by and sort of bathes in darkness as part of his daily MO,” Soule says, so he was determined “to find a way into the story that didn’t make me feel miserable all the time…I wanted to find a way to tell that story that wouldn’t be massively depressing either for me or for the readers. 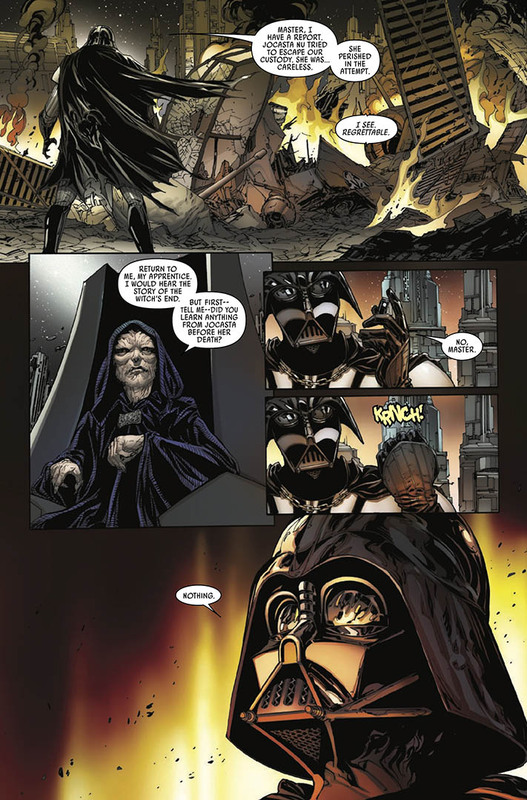 As a reader, at times Vader seems to consider turning back to the light and toward his own redemption, through actions that contrast with his role as the Emperor’s brutal right hand. In issue 10, Vader captures a data file that contains the names of every Force-sensitive child the Jedi had identified before Order 66 nearly wiped them out. Jocasta Nu has died, desperately trying to get off Coruscant with the information salvaged from the Jedi Archive she once oversaw, “because she did not want that to fall into the Emperor’s hands,” Soule says. But instead of turning it over to his master, Vader crushes the data file and lies toEmperor Palpatine about the success of his mission. “I think that’s a very debatable moment and I left it,” Soule says. “I could have made it more clear as to why he did that but I left it ambiguous because you don’t know if he wanted to avoid giving the Emperor more power, or was it that he wanted to avoid other children going through what he went through — being manipulated and turned the way the Emperor had done to him? Or was it some other Vader-y motivation? You don’t know. That is what I tried to do every opportunity I had, to make his motivations a little bit opaque. Is it Anakin doing this or is it Vader doing this? Because Anakin’s still kind of fresh with him, he’s only been in the suit for a little while at this point so you could see him maybe making redemptive choices here, but you don’t know. It could just be this is a very strategic, smart choice for Vader to make to avoid the Emperor getting more Force-sensitive people that could possibly attack him at some point.” Maybe Vader just doesn’t want the Emperor to have a chance to replace him, as he has so often with other apprentices in the past. 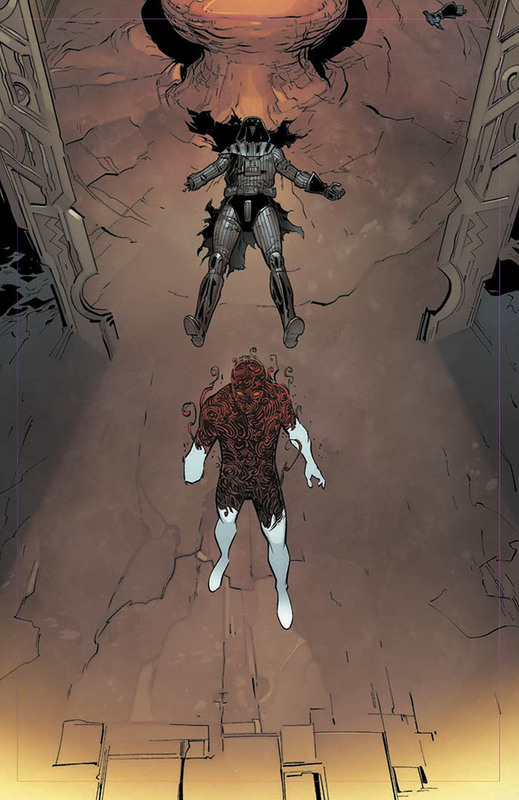 The speculation continued with the erection of Vader’s castle and the antagonist Momin, a death-defying creature in a mask who also provides some levity throughout the series as his corporeal form changes — with each misstep, Vader kills the host and places the mask on a new victim to show his frustration with the process of building a castle. “It felt right to me to make it a little bit lighter because I knew where the story was going to go after that,” Soule says. 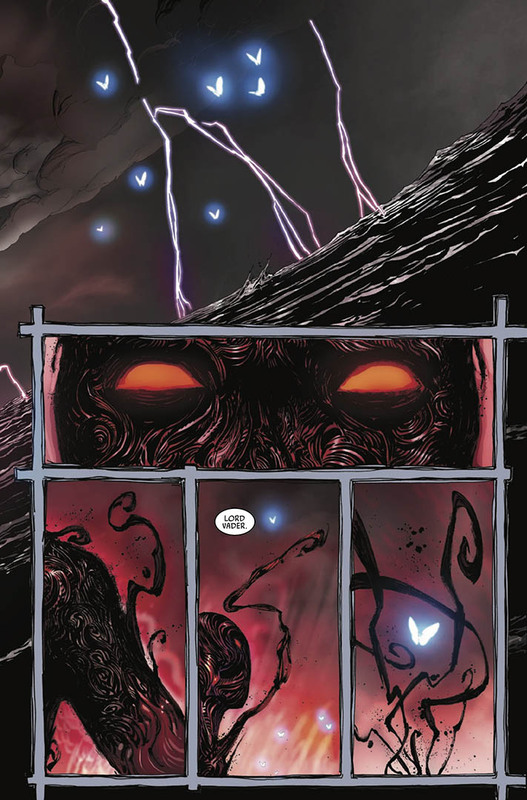 The climactic final issue is a masterful fusion of storytelling and art. 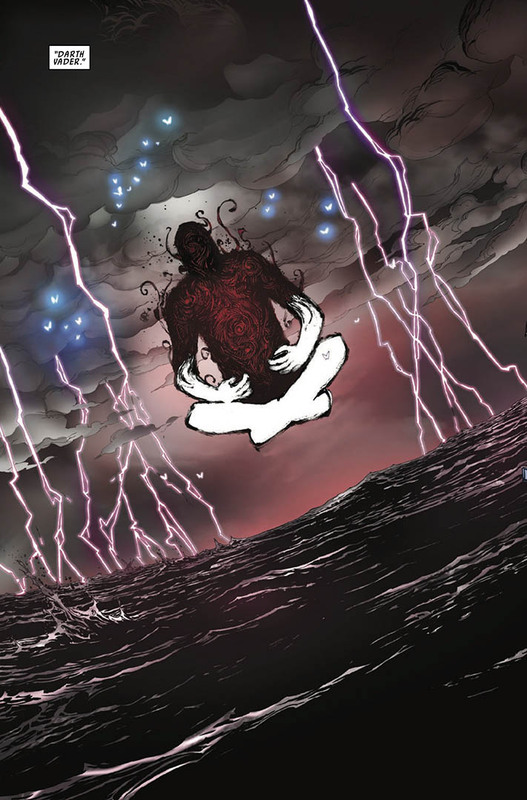 As Vader steps through the portal, he leaves behind his shattered body and enters the mindscape of his earlier meditations. “This was a very difficult issue because it’s largely silent in some ways,” Soule says. “The main character doesn’t speak very much.” So much must be conveyed through the illustrations and coloration. The art team brilliantly translated Soule’s description into quiet depictions of frustration and seething anger, despite working with a main character who almost devoid of facial expression. “He just has eyes and the eyes don’t move very much,” Soule says. In his mindscape, Vader faces the Jedi Council, cutting down members recently dead and some still living. “They’re the ones he felt kind of betrayed him. They wouldn’t make him a member of the council.” Ultimately, he finds Padmé, or a version of her seemingly alive but already decked out in her funeral garb, yet he still cannot save her.